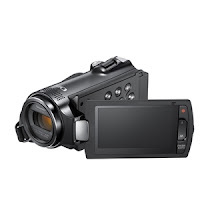 The Samsung H200 high definition camcorder allows you to capture your favourite memories in superb detail. Memory card compatibility: SD SDHC. Accessories included: USB cable AV cable. -Great video quality in all modes, 60 frames per second really helps here. -Stills from video look great for prints up to 6x9 (1080i) or 4x6 (720P). -Great battery life, around 2.5 hours. Compare that with Canon, Sony or Panasonic. Download Format Factory! Most editing programs have trouble with the AVCHD format and this "FREE" program converts your camera video to your format of choice. You can choose file size and frame rate. This will make your life so much easier. "This may be Windows only". Google it! cons: In 720P mode a new file is created every 20.5 minutes which results in a small but noticable gap in your recording. If you plan on using this to made DVD's or web video, 420P (720x480) will do nicely and last over an hour before a new file is created. Probably more often in 1080i but most of my shooting is in 720P. Samsung H200 - good camera but some build quality complaints.